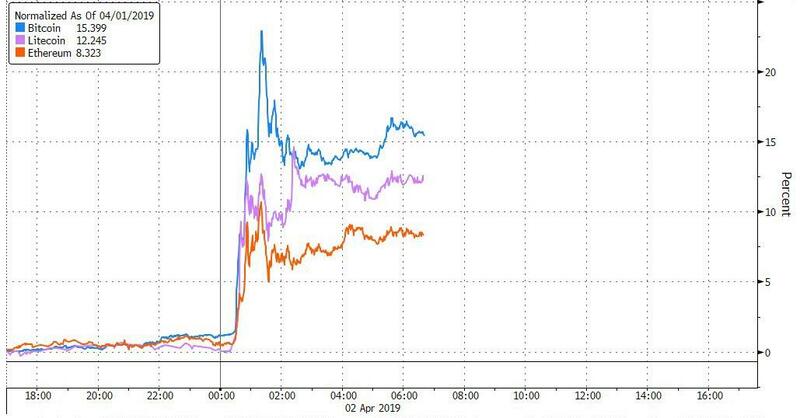 Update (1950ET): The third leg of today's massive surge in cryptocurrencies has lifted Bitcoin Cash up over 70% on the day, Bitcoin and Ethereum up around 20% and Litecoin up 35%. It is clear that this is anything but an 'April Fools' joke as so many mainstream media types tried to shrug off the action. The big moves have occurred as European markets opened, as US markets opened, and now as Asian markets opened. As CoinTelegraph's Ana Alexandre notes, Brian Kelly, the founder and CEO of digital currency investment firm BKCM LLC, said that the next Bitcoin (BTC) target is going to be $6,000, CNBC reported on April 2. 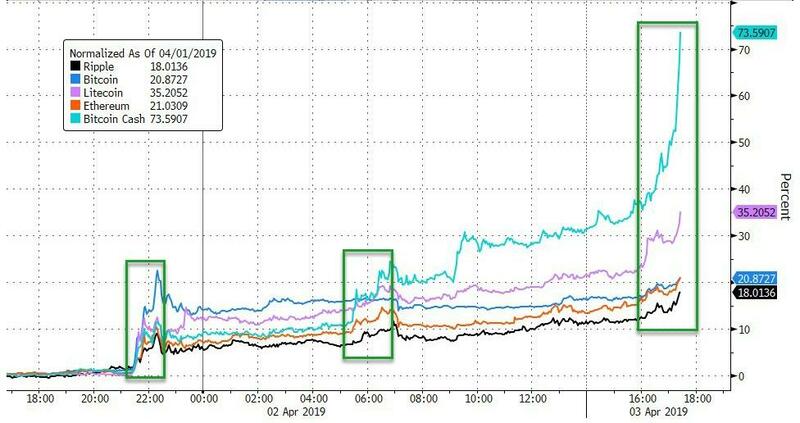 At its peak, the 23% intraday move, which added more than $17 billion to the value of digital assets, was the biggest since early 2014. Even after paring some gains, with bitcoin currently up just over 15% at $4,777.81, the daily swing was the biggest since the euphoric peak bubble days of late 2017. "There has been a single order that has been algorithmically-managed across these three venues, of around 20,000 BTC,” he said. 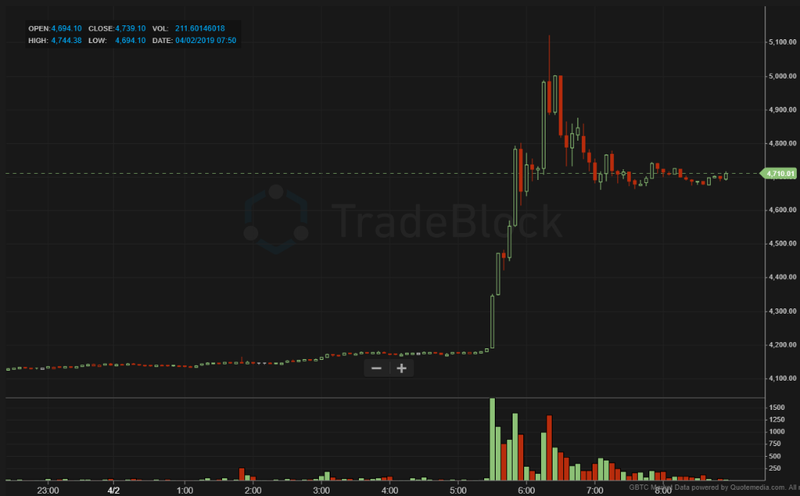 “If you look at the volumes on each of those three exchanges – there were in-concert, synchronized, units of volume of around 7,000 BTC in an hour”. 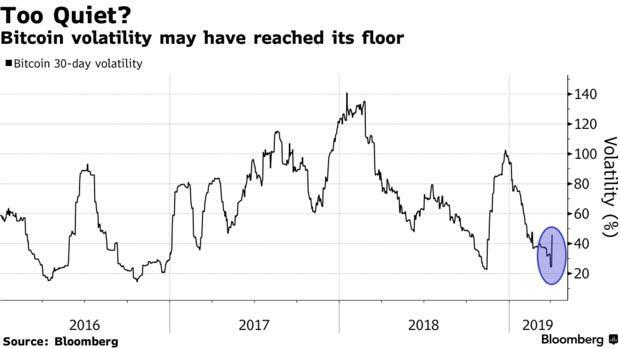 Another possible reason: crypto vol has troughed, prompting renewed interest in the asset class by investors seeking volatility at a time when cross-asset vol has likewise collapsed. Another theory: renewed interest in money "offshoring" by Asian and/or Turkish investors. Of course, it may well be the case that with all central banks once again caught in a rush to debase their currencies and ease monetary policy, investor interest is once again turning to fiat money "alternatives." 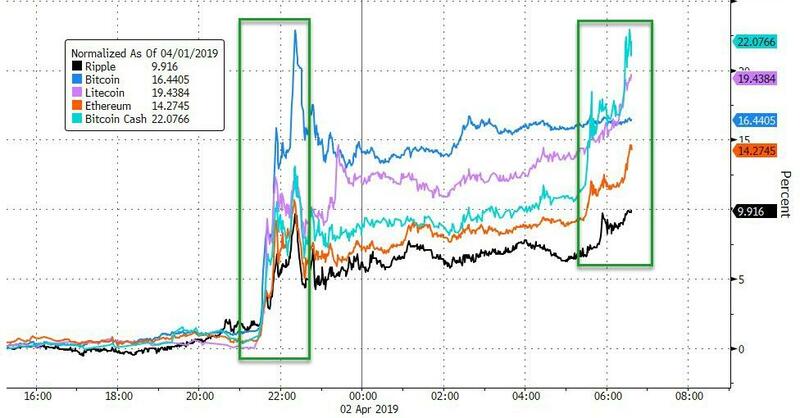 Outsized price moves of the kind rarely seen in traditional markets are common in cryptocurrency markets, where liquidity is thin and prices highly opaque. So orders of large magnitude tend to spark buying by algorithmic traders, said CryptoCompare's Charlie Hayter. 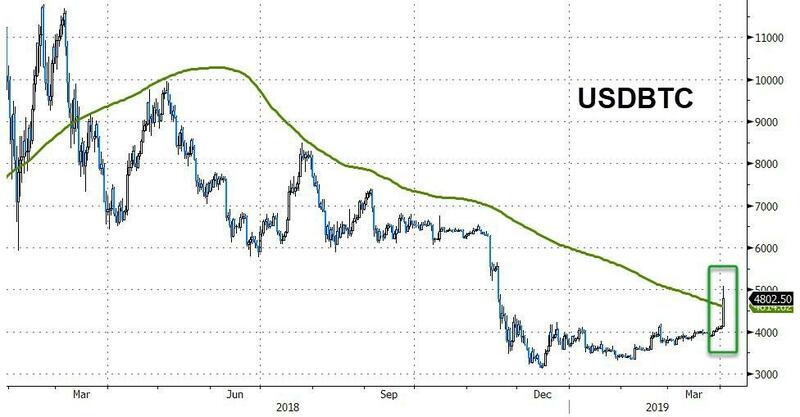 To be sure, bitcoin susceptibility to unexplained, erratic price swings is nothing new and made it very popular among speculators, who are seeking a return to the glory days of 2017 when Bitcoin surged more than 1,400%. However, since its peak around $20,000 in late 2017, bitcoin suffered a 74% crash which eliminated much if not all of the froth in the former asset bubble. 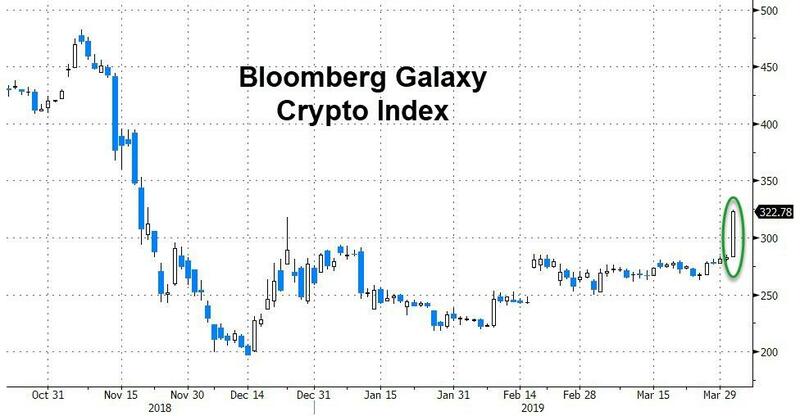 Of course, erratic moves such as this one have deterred institutional investors, whose concerns about cryptocurrencies range from uncertain regulation to exchange hacks and market manipulation. Last week we asked, “When FOMO?”, pointing to the market where Bitcoin was trying to consolidate above the key $4,000 level while also having to deal with expiring futures and options contracts. In particular, as we pointed out, decent size was noted at 3500 strike (puts). For those that are yet to be convinced of the importance that derivatives market has on the underlying, it is worth pointing out that last Friday was another record day for Deribit with more than $40mln BTC options traded. Still, looking into the future (June options), there are early indications that the market is turning more bullish, with plenty of interest noted at 6,000 strike (calls) where there is already OI of 2342.9 (delta 0.23). 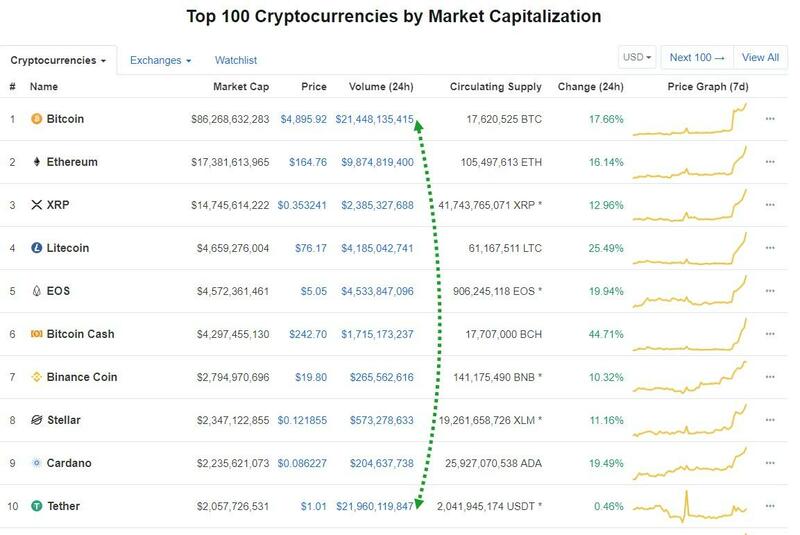 Looking elsewhere, as pointed out by The Block, Tether (USDT) has experienced its highest daily volume since first being issued in 2015. According to data from CoinMetrics.io, on March 31, 2019, there were 38,150 USDT transactions processed. As a reminder, Tether Limited updated its website to clarify how its reserves are made up. The company now claims that each coin is backed by "reserves, which include traditional currency and cash equivalents and, from time to time, other assets and receivables from loans made by Tether to third parties." 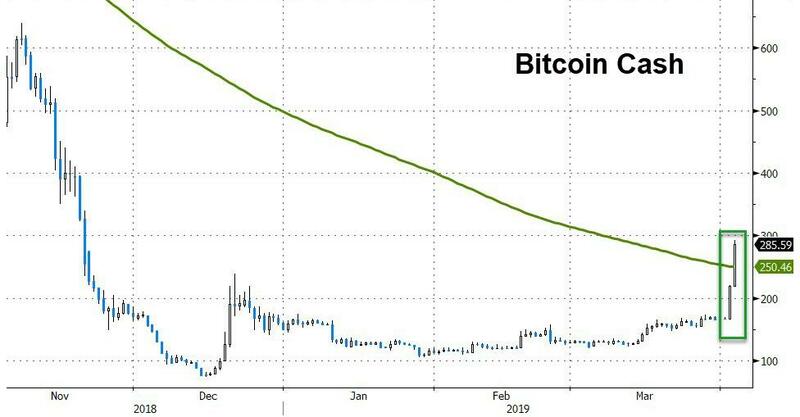 Finally, something to ponder about…when Bitcoin futures were launched back in Dec'2017, the influx of hot money saw the prices rocket all the way to $20,000 but what is more interesting is that the futures curve was trading in contango. Since then, the curve has evolved and is generally trading in backwardation. However, Ethereum futures curve has been trading in contango for a long time and many argue that this is because of oversupply. Could it be that the natural state of the Bitcoin & Ethereum curves is a contango? As opposed to Keynes’ longstanding theory that the natural state of commodity markets is backwardation.